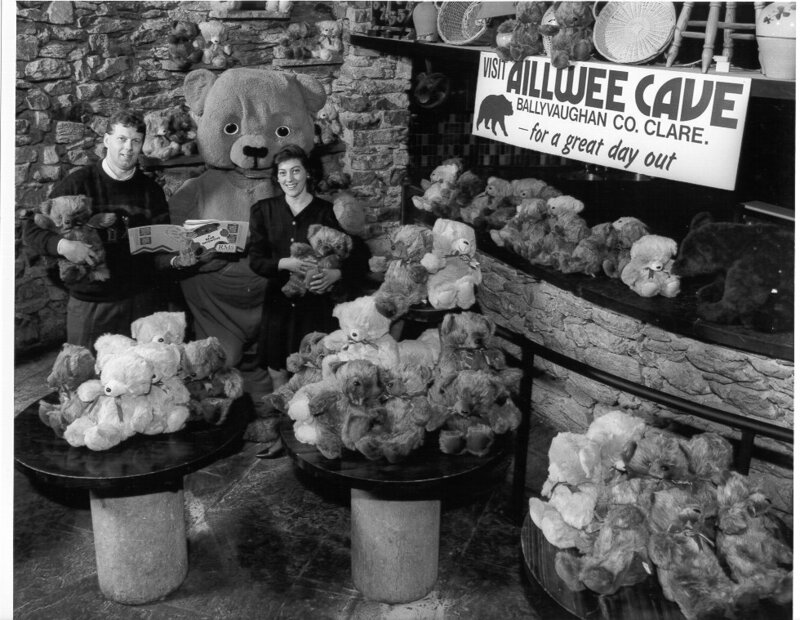 The Life and Times of Aillwee Cave’s Edward Bear. As Aillwee’s Edward Bear celebrates his 40th Birthday, we look back over his eventful life so far! Since 1976, when Aillwee Cave first opened to visitors, Edward Bear has been keeping a close eye on all activities on Aillwee Mountain. He has also joined in on many an occasion. Edward is very proud of his ancient lineage. Remains of the European Brown Bear were found during excavation of the cave system, which also led to the discovery of Bear Hibernation Pits or ‘The Bears’ Beds’. The bears probably scraped out hollows in the cave floor and rested in these for the winter time. The year round cave temperature of 10 degrees celsius doesn’t flucuate much which means, for a lot of the Winter months, it is actually warmer and drier in the cave than outside. A perfect shelter for Edwards’ ancestors. Eddie himself has played host to some eventful goings on in and at Aillwee Cave over the last three generations. A highlight year for him was 1991 – On April 7th Edward and Aillwee Cave played hosts to Bear Day. In the lead up to the day itself individuals and businesses sponsered Teddy Bears which were then sent to an Orphanage in Romania. Balloons were also sponsered and let off from Aillwee Mountain with a return to sender message on them. The furthest one received back to the office was from Belgium! Like us all Edward loves a cup of tea. In 1997 (and the years that followed) he always encouraged our staff and visitors to enjoy a cup of tea especailly on Alzheimers Tea Day. We still celebrate the black stuff by rewarding pedal pushers with ‘A free Cup of Tea if you cycle to me’. The Millenium was also a year to remember from Edwards Diary. 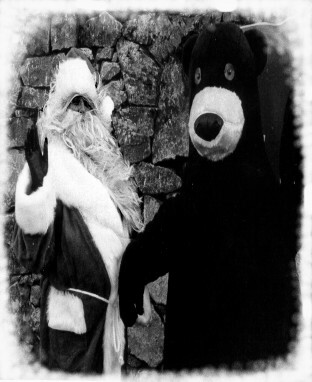 December 2000 saw Edward and the staff welcome Santa Clause to the cave to meet with children in the run up to Christmas. Such was the welcome he recieved from Eddie that Santa has made the trip to Aillwee for 16 years in a row. Well, if Winter in Aillwee Cave is good enough for Edward and his ancestors then it must be the perfect spot for Santa too! Eddie loves when other furry friends come to visit. There have been many Easter Sundays when he and The Easter Bunny have really enjoyed each others and our egg hunting visitors’ company. Over the years Edward and his Aillwee helpers have appeared at St. Patrick’s Day Parades and enjoyed underground music concerts and theatrical plays in the cave. He is ‘taster in chief’ of our Burren Gold Cheese and has held this role since our cheese making started in 1985. It is also very evident that Eddie has a healthy respect for Sika, our beautiful White Tailed Sea Eagle, just one of our wonderful raptors at The Birds of Prey Centre since 2008. More recently, Eddie loves to venture into Aillwee’s Woodland Craft Village from time to time to perfect both his Bushcraft Adventure and Archery Skills. 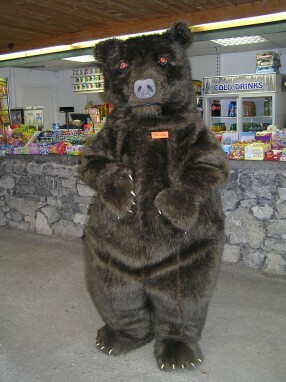 So Happy Birthday Eddie Bear, may you have many more escapades in Aillwee Cave!